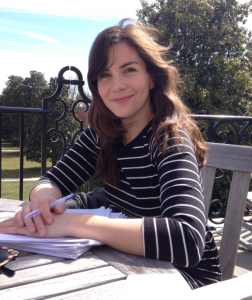 Professor Sarah Hogan is a scholar of sixteenth- and seventeenth-century British literature, in her fifth year of employment at Wake Forest University. She hails from the snowy Rust Belt region, having grown up just outside of Rochester, NY, before earning a BA and MA from Syracuse University and a PhD from The University at Buffalo. She is the author of the forthcoming book, Other Englands: Utopia, Capital, and Empire in an Age of Transition (Stanford UP, May 2018), a literary-critical study on the cognate origins of capitalism and utopian fiction. Dr. Hogan’s publications on writers like Thomas More, Francis Bacon, and Edmund Spenser have also appeared in academic venues like The Journal of Medieval and Early Modern Studies, Upstart, and The Journal of Early Modern Cultural Studies, and literary arts web journals like The Rumpus and The Collagist. At WFU, Professor Hogan regularly teaches British literature survey courses, including the gateway to the Major, along with courses on topics like Renaissance women writers, literature of the Atlantic encounter, sixteenth-century poetry, and the utopian and dystopian tradition. In all of her courses, Professor Hogan works to cultivate a communal classroom environment that encourages students to read older works of literature in both historicist and “presentist” ways—in other words, to understand how texts respond to their own cultures and contexts but also continue to accrue new meaning and significance in later moments of reception. She enjoys helping students connect with early English authors, often by highlighting the ideological, affective, and transformative power of cultural expression.